Santos Sandy Alomar was born October 19, 1943 in Salinas, Puerto Rico. The five foot nine switch hitter was signed by the old Milwaukee Braves in 1960. In his playing career he was a good steady defensive second baseman with speed on the bases. Alomar was a great line drive singles hitter & good sacrifice hitter as well. He batted .292 at AA Austin in 1963 making it to AAA Denver the next year. In 1964 he got a September call up & in his first MLB at bat he singled off the St. Louis Cardinals (future Met) Ray Sadecki driving in a run. He played briefly as a reserve player with the Braves from 1964-1966. He saw the most action in 1965 playing in 67 games at short behind Woddy Woodward. In December 1966 he was traded, along with Hall of Famer Eddie Mathews, who was at the end of his playing career to the Houston Astros for Bob Bruce & Dave Nicholson. But at the end of Spring Training, he was traded to the New York Mets for Derrell Griffith. 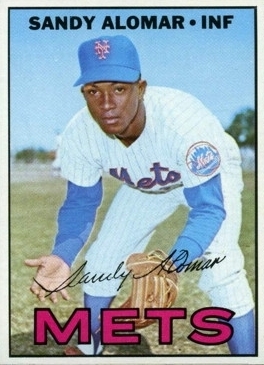 Alomar made his Mets debut In the second game of the 1967 season getting inserted as a pinch runner in a 3-2 win over the Pirates. Alomar played in just 15 games his Mets playing career, going hitless in 22 at bats, striking out six times. He scored a run on April 20th, after being inserted as a pinch runner in the second game of a double header against the Chicago Cubs. On August 15th 1967 Alomar was sent to the Chicago White Sox along with veteran Ken Boyer for Billy Southworth & a player to be named later. In 1968 he became the Sox regular second baseman batting .253 with 21 stolen bases in 133 games played. In May of 1969 he was traded to the California Angels for Bobby Knoop. Alomar was the Angels main second baseman for the next five seasons (1969-1973) becoming a steady reliable player. He played every game of the 1970 & 1971 seasons, leading the league in games played & plate appearances. In those years he stole over thirty bases both times & was in the A.L. 's top ten in stolen bases six years in a row. In 1970 Alomar made the All Star team, his 35 stolen bases were third most in the AL., as he batted .251 with a .302 on base %. He played 153 games at second base (2nd in the AL) with 40 assists (2nd in the AL) 375 put outs (3rd in the AL) making 18 errors (2nd in the AL). 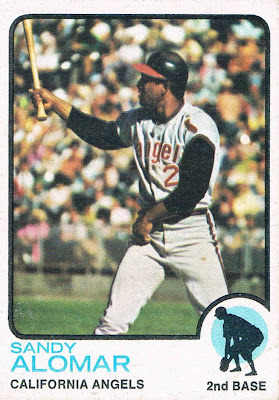 In 1971 he was second in the AL with 179 hits, although he batted just .260 due to league leading 689 at bats. That year he had career highs in doubles (24) HRs (4) RBIs (42) & stolen bases (39). That year he was third inthe league behind Royals players Amos Otis & Fred Patek in steals. At second base he was second in the league with a .989 fielding % turning over 100 double plays for the third straight season. He made just nine errors in 791 chances, with 350 put outs. 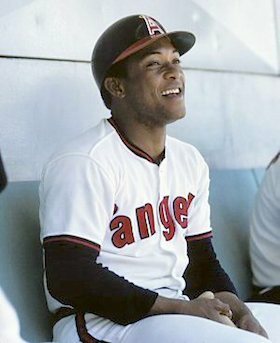 He played two more season with the Angels witnessing Nolan Ryan's first two no hitters in 1973 from the second base position, while helping in the put outs. In 1972 he helped co author the book How To Play Infield. In May of 1974 the AL New York team purchased his contact & he became their regular second baseman in 1975. He succeeded Horace Clarke & took over the position from Fernando Gonzalez. Alomar played in 151 games hitting .239 with 2 HRs 13 doubles & 39 RBIs. He was pretty much expendable when Willie Randolph came on the scene, playing in just 67 games in 1976. He appeared as a pinch runner & pinch hitter (0-1) in the 1976 ALCS against the Kansas City Royals. He finished his playing career in Texas with the Rangers in 1978. In a 15 year playing career he was a lifetime .245 hitter with 1168 hits 126 doubles 19 triples 13 HRs 282 RBIs & a .290 on base %. On the field he posted a .977 fielding % making just 128 errors in 5688 chances at second base, playing 1156 games. He also played at short, third, first & some outfield. Coaching: After playing baseball Sandy became a successful coach, first with San Diego Padres from 1986-1990 where he got to coach his two sons, Sandy Jr. & Roberto Alomar. Both of them had successful baseball careers as well, with Roberto making the Hall of Fame in 2011. From 2000-2004 Sandy Sr. was with the Chicago Cubs & Colorado Rockies coaching staff's. 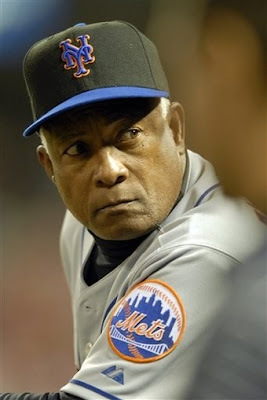 In 2005 he was bench coach under Willie Randolph with the New York Mets. 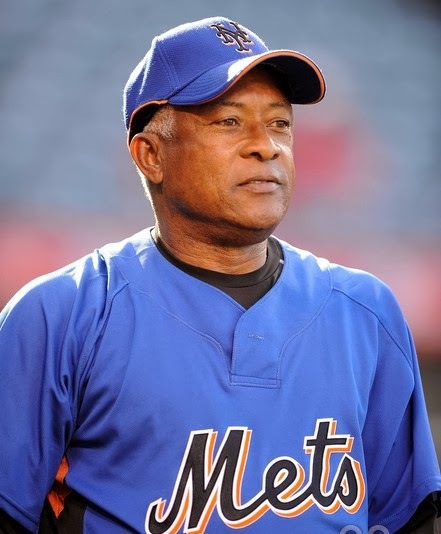 In 2006 he moved to the first base coaching box for the Mets NL Eastern Division winning season. 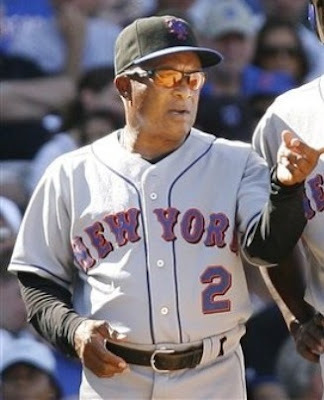 He then became the Mets third base coach in 2007. 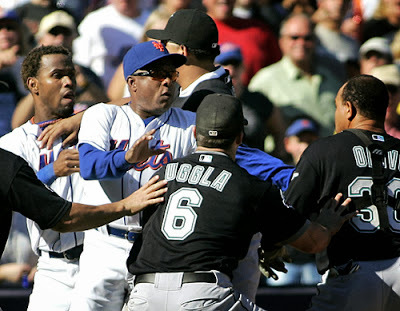 In a famous incident on the next to last day of the 2007 season; Alomar jumped into a brawl that was staring up with the Mets Jose Reyes & Florida Marlins; Miguel Olivio. The Mets were in jeopardy of missing a chance at the playoffs, after a huge collapse in the NL East. On this day John Maine flirted with a near no hitter as the Mets romped the Marlins. Reyes & Olivo exchanged words as Reyes was on third & Olivo was in conference on the mound. Alomar held off the catcher jumping in front of him. The Mets won that day but lost the next day & were eliminated. In 2008 he went back to the dugout as bench coach, this time under new manager Jerry Manuel. I got to meet him at Spring Training 2007 while sitting in the first row at Dodger Town. Of all the players & coaches Alomar was the most accessible and a true gentleman. Sandy & his wife Maria have three children & six grand children. The Alomar's are devout Catholic's.